Stabilizing (i.e., strengthening) the existing subgrade and providing stable base and subbase layers above the subgrade. Providing adequate water drainage, because water can weaken soils and asphalt pavements. Thick enough to structurally carry all expected traffic loads for a period of time. Properly compacted to develop its full strength and prevent water penetration into the pavement and its base. Surfaced with a wearing course that resists wear, deformation, weather, and remains skid resistant. 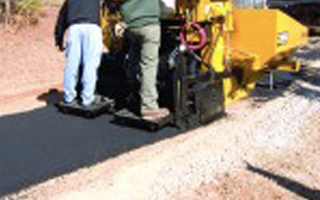 The following method applies to installation of new asphalt drives, streets and parking lots. After evaluation of your property by one of our asphalt specialists. We will then recommend if any import or export and grading of existing soils are needed. Compaction methods to suit your particular job will meet or exceed industry standards. Placement of new asphalt shall be by a self propelled paver, except in small areas that a paver cannot access. After evaluation of your property by one of our asphalt specialists. We will then choose the proper size of equipment, amount of lifts and compaction methods to suit your particular job that will meet or exceed industry standards.